Jeremiah Isgur is known around these parts as The Sheriff. He is a senior technical producer of customer engagement systems—the group responsible for the technology behind Magic organized play. In his spare time he lives in the future. Despite sharing two colors, the Mardu and the Abzan couldn't be more different. 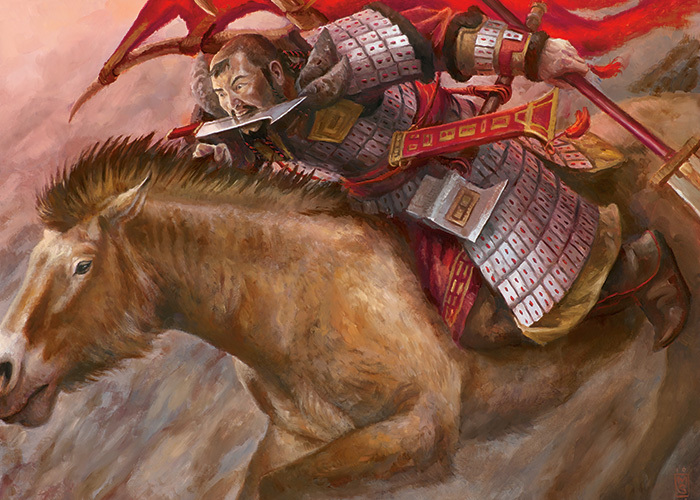 The Mardu emphasize speed, moving fast and striking hard to seize the spoils of victory. 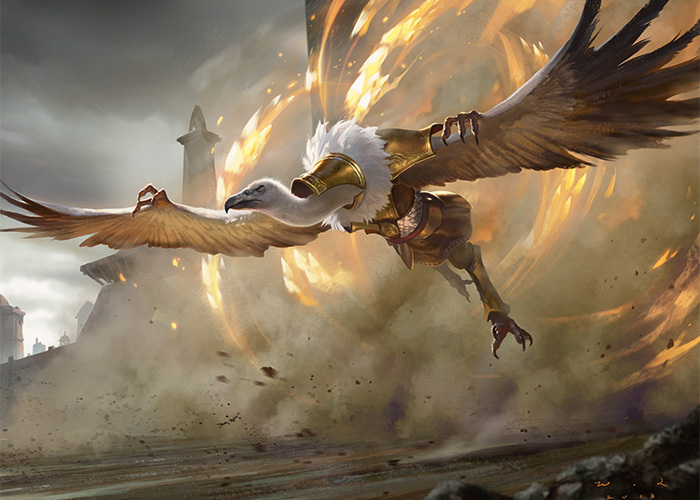 The Abzan believe in endurance, outlasting their opponents and fighting to be the last ones standing. "Captain." The lieutenant jogged up beside him, kicking up a spray of dusty sand that drifted sideways in the breeze sweeping across the craggy steppes that hot afternoon. "Do you see that smoke there on the horizon, to the east of Golem Rock? That could be a Mardu camp." He raised his arm to illustrate the vector and pointed with his gloved hand, each overlapping metal plate of the articulated fingers clicking into place as he straightened his index finger. "Good eye," Riza responded, scanning in that direction. "But that is no Mardu encampment. We would see many campfires as they like to make a show of numbers in order to confuse enemies. 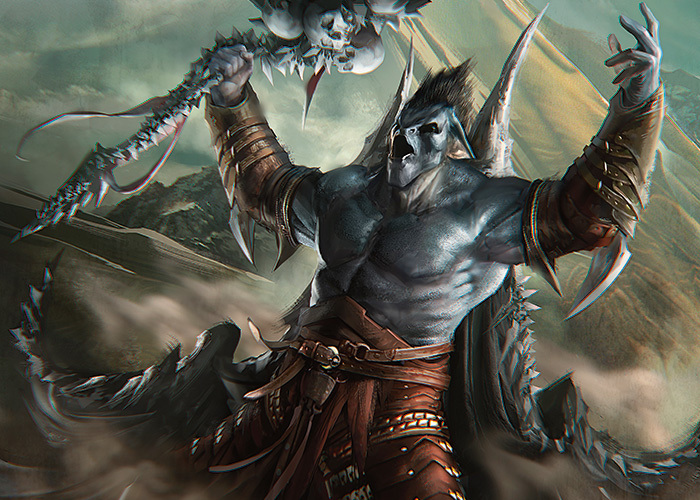 And if it was a Mardu scout, the only evidence we would see would be the hoof prints left in the dirt." Riza breathed a quiet sigh of relief that his lieutenant was wrong. Let us pray, he thought, that we do not make contact with the enemy for the remainder of this patrol. He looked over his shoulder at his men, fifty strong, walking in two columns, maintaining a disciplined march, but engaged in small talk and laughter. "When I get back to my wife," his krumar chief of scales boasted, "I'm going to drink an entire jug of wine, eat an entire hindquarter of a goat, and I will not leave my bedroom for two days." "And I," Riza replied, "will sing my children to sleep." He paused. "And then drink a jug of wine, eat a goat, and retire to my bedroom." His men laughed as they marched the shepherd's path that paralleled the Salt Road, moving ever farther from the safety and civilization of the Abzan territories. As the day wore into a reddish afternoon, the lieutenant again hurried up to the commander's side. "Commander, do you see that smoke there?" He pointed it out in the hazy distance. "It looks like many campfires." "Yes," Riza replied slowly, his smile fading, "I do see that." He stopped and his men drew to a halt behind him. "What do you make of that?" "Sir," his battle priest said, "I do not think that is a campfire. I sense something very different." The patrol marched on, more quietly now as they slowly approached the distant smoke. It became obvious that it was not campfires they were seeing but burning buildings, as the smoke rolled up thick and black, drifting back and forth in the shifting desert winds. The men grew silent and wary, keeping keen eyes in all directions. The patrol's falconer dispatched their buzzard who screeched as he took wing, a stray feather circling back to the ground behind him. Eventually, they reached the source of the smoke, a summer camp for the shepherds who grazed their flocks in the grasses of the nearby mountain slopes. The horror of the scene was hard for the men to absorb. They had seen villages ravaged by Mardu hordes before, but nothing quite this brutal. The small village lay in utter desolation. No survivors were left. Men, women, and children lay where they fell, splayed open or missing limbs and heads. Each of the wood-framed lean-to huts smoldered, with not one left standing. The patrol fruitlessly looked for survivors. The scouts counted hoof-prints to determine the size of the horde that had moved on to the north, estimating at least one hundred. I do not want to meet this horde, the commander thought as he ordered his men to bury the bodies. The hordechief dropped the goat bone he had just stripped of its meat and chugged the last gulps of wine before letting the vessel fall to the ground and break. "This is the fruits of our labor!" he exclaimed to his warriors as he slumped back on his pillows. The small army arrayed across the field before him looked up from its meat and wine to hail its fearless leader. "Backstabber, take stock of our new supplies and figure how long before we must loot again." Backstabber took a final bite and slinked away to count the stolen goats and cheeses. "Nightrider, we must discuss our next target." He motioned his advisor to come closer. "The shepherds will be moving their flocks north to the villages for winter. Let us raid while the pickings are easy." And keep away from Abzan strongholds when we can, he thought. He surveyed his horde—orcs, humans, goblins, horses, all relying on him. They need me, he thought, self-satisfied yet grave. Their survival depends on my unwavering certainty. Any crack in my façade is the opportunity another will take to become horde leader. It is how I gained my rank, it is the way of our people, and it is what has kept us alive for so many generations. He was roused from his introspection by the return of one of his spies. The diminutive goblin slinked up and whispered in his ear. "I have news. An Abzan patrol is tailing us, only half a day's ride to the south. Their numbers are half of ours, mostly on foot, well-armed and armored, and they know we are here. They have seen the shepherd camp." He looked up at his leader, awaiting a reaction. The horde leader breathed out slowly, reached for a nearby flagon, and drank deeply. "We are outnumbered two to one," Riza, the patrol captain, said to his top lieutenants, who stood in a circle around a map of the area. "I do not think direct confrontation is wise." "Sir," said his battle priest, "we are the law on the Salt Road. If we do not act, more innocents will surely die." 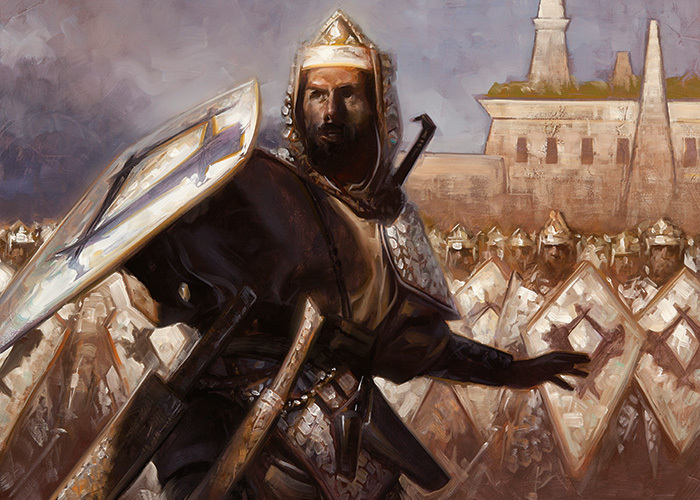 "If we march out there and confront the Mardu," Riza replied, "we will find ourselves outflanked, outnumbered, and completely open to their deadly archery. If we are slaughtered by the horde, no one will protect the shepherds who feed the Sandsteppe Gateway." His men murmured consent. I am afraid, he thought, but I must remain steadfast. The Mardu strike like lightning on a dry day. We will be slaughtered like stray dogs and I will never see my family again. "We will fall back to the oasis at Canyon Falls and await the larger Salt Road patrol. Once we rendezvous, we will have the strength and support to drive the horde back to their lands. Lieutenant, send runners to find the patrol and apprise them of our situation. Also, engage our spy to put eyes on the horde." 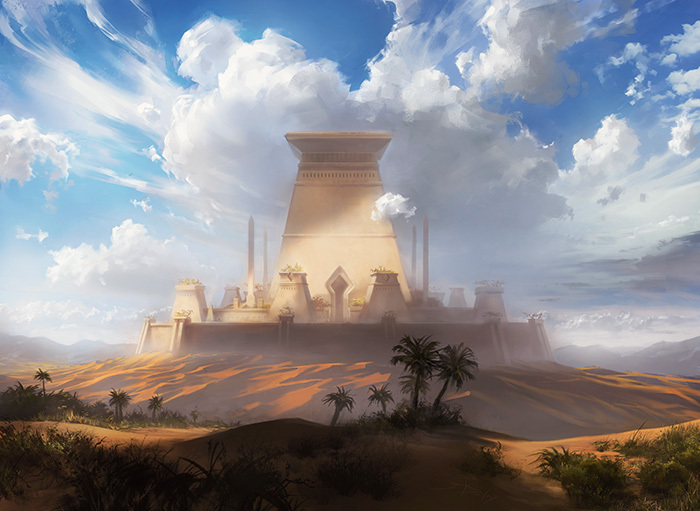 When the Abzan had finished burying the dead and giving their rites, the patrol rested briefly before packing up and backtracking toward the oasis. The hordechief stood up and brushed crumbs and gristle from his belly. "Abandon your feast," he yelled with a suddenness that froze his warriors arrayed around him for hundreds of yards. 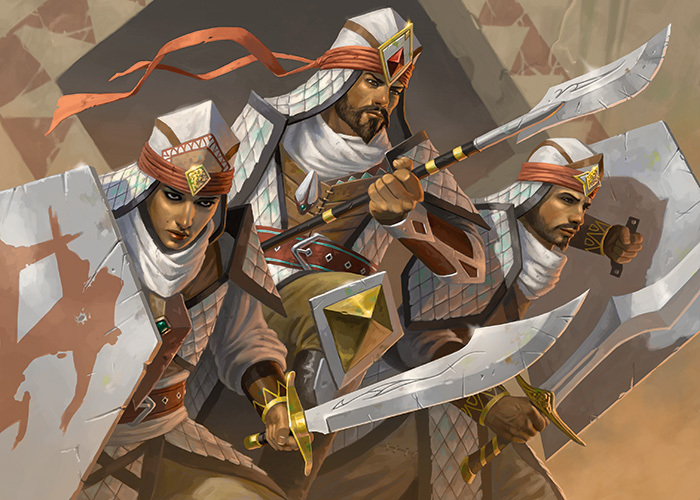 "The foolish Abzan have sent a patrol after us that is half our strength. Once we slaughter them we will be free to raid these lands at our will. Anyone who makes an Abzan kill may claim the spoils of the body." The leader's advisors stared in shock at the unexpected dictate. Only the quartermaster spoke up. "I advise against this," she said. "We are fat with supplies and hoped to give our warriors a deserved rest. If this patrol is so weak, they are no threat to us. Let us feast for a night and enjoy our victory." Anger flashed in the hordechief's eyes. "Do you want to lead this horde? Do you want the responsibility on your shoulders? Because if we wait, the Abzan will gather their strength and build their defenses. Reinforcements are never far behind their patrols. You do not question my orders." The quartermaster's mouth twisted into a pained expression as her eyes flinched away from the leader in a submissive gesture. "I am giving you a warning so that you will remember not to question my authority in front of my people. Hold out your hand." The quartermaster tentatively reached her hand toward the leader, who quickly snatched it, drew his knife, and sliced the tip off the pinky finger before she could react. The other advisors backed away, ready to fulfill the hordechief's orders. It pains me to hurt her, he thought, but there can be no question of my absolute authority. "We ride at once!" he screamed at his people, who burst into action, packing their camp and gathering their mounts as the golden sun turned red on its last dip toward the horizon. The buzzard spy returned to the patrol early the following morning, circling down from beyond the vision of ordinary men. The sun had not yet crested the mountains to the east and the desert dew lay thick on the crumbly earth. The moon had not yet set and the patrol navigated by the watery reflection off the flat earth. "The horde has turned south to engage us," the falconer reported. "They have been riding all night and will be upon us before noon." The captain gathered his lieutenants around him but did not halt the march. They stepped to the side to confer quietly, out of earshot of the rank and file. "We cannot retreat as fast as they can ride," he began. "There is little hope we can rendezvous with the larger patrol before we are caught. I am afraid our only hope is to prepare for a direct fight." "If we hurry, sir, we might be able to reach the oasis. The canyon will nullify the advantage of their cavalry. We might be able to establish a strong defense using the terrain and trees of the oasis. If we can hold them back, we may be able to outlast them until reinforcements show up. We will have access to water and shelter, and they will be fighting from the open desert." The first lieutenant looked at the other men, pleased. The captain looked at each of his lieutenants in turn. No one disagreed with that course of action. "If we are caught retreating, we are surely dead. But even if we stand and fight here we will probably perish anyway. Let's give ourselves the best odds." He stood tall among his men. "Double time," the captain ordered, and jogged to the front of the ranks. The hordechief slumped forward a bit on his warhorse. Riding through the night was tiring. But not as tiring as marching, like the Abzan were surely doing. He had hoped to overrun them in the dark and take them unawares, but clearly they had been alerted to his plans. The horde had been following the retreating tracks of the patrol ever since they had passed the burned-out shepherds' camp. If the Abzan had time to establish a defensive position, it would be foolish to attack them head on. His riders were swift, but they were lightly armored. 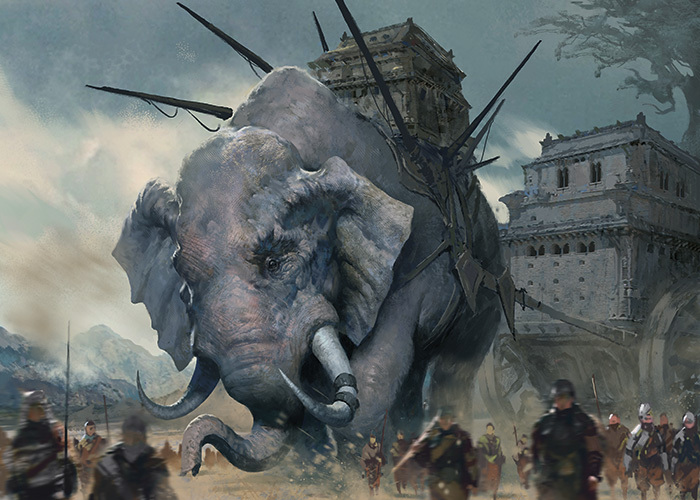 Even a smaller Abzan patrol could prove devastating once it had prepared for an attack. But now that his plan was set in motion, he had to retain the initiative. To change course would be a sign of uncertainty. He could not show weakness if he wanted to maintain his position as hordechief. At that point, he simply hoped they would come upon the Abzan before their enemies had time to gather reinforcements or establish a defense. It was still possible, although it was turning into a larger gamble than he had hoped for. But this was the way of the Mardu. The strong survive. And the clan was strong. They had been living off of the labor of the weak for generations. All these warriors were relying on him to provide unwavering leadership in order to survive. The traditions of the clan, which had kept them alive and thriving for so long, must be maintained. Perhaps this would be the day they were to die. But if not, then his position as leader would be extended once again. The captain gathered his lieutenants in the shade of a boulder and passed his water skin around. The day was already hot. 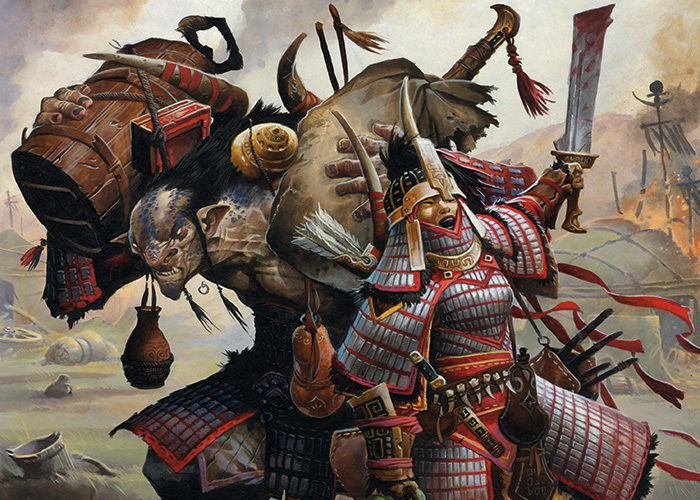 The fifty men of the Abzan patrol filled their water skins from the oasis pool and watered the few ibex. "Ogan Shieldmender, join us," Riza said to his Mardu krumar chief of scales, who stood nearby scanning the horizon for signs of the horde. "Array your men at the mouth of the canyon and form a shield wall. Make sure they have ample spears and water." The krumar hurried to fulfill the captain's orders. "Hide our archers among the boulders along the west rim of the canyon to keep the horde away from that side. That should protect the men and supplies at the bottom. Send the rest of the men to the north end of the canyon where the spring begins to flow and set an ambush in case they try to come at us from behind. Keep four soldiers with the gear to resupply us and run my orders to the troops." His lieutenants nodded. The battle priest supplicated himself to the ancestors and passed his blessing on to the troops, who crowded around the shade of the palms that grew along the spring bed. "When we are on patrol, you are my family," Riza said to his soldiers. "It is this bond that gives us our strength. 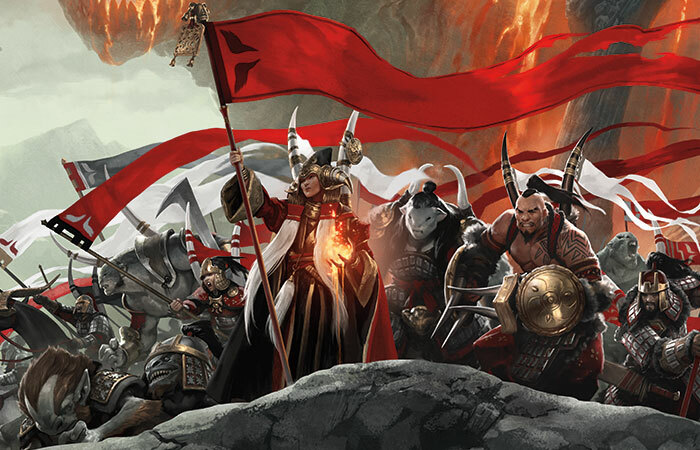 I believe in the capabilities of this unit and together we will make a defense worthy of our Abzan heritage." The troops shared the interlocking handshake of the Abzan military and quickly busied themselves. The Mardu horde picked up speed as the oasis came into view. Only a few miles of hard, pebbly desert separated the two. Although the horde had ridden through the night, it was not exhausted. The temptation of battle and the hope for glory spurred it on. 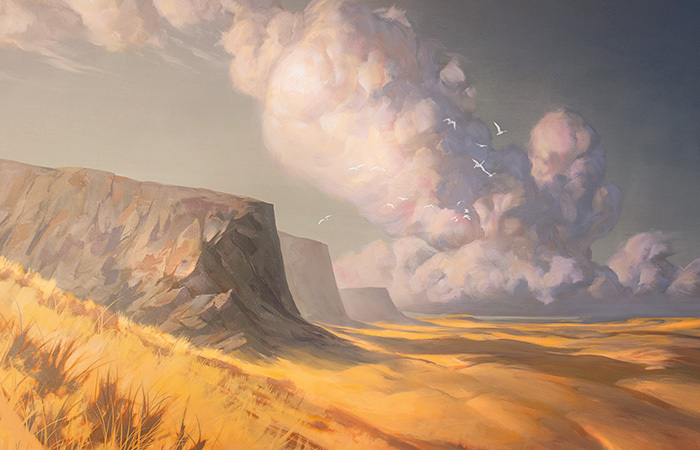 The hordechief looked back at the line of dust stretching hundreds of yards across the flat steppes. He closed his eyes and listened to the thunder of his cavalry, felt the hot desert wind rush through his hair. Victory was no longer in is hands. It was in the hands of the dragon now. The speed of the dragon's wings would win the day. "The horde is closing!" cried the runner as he swept past the men stationed at the mouth of the canyon. Twenty-five heavily armored dragonscale infantry took up their spears and locked shields forming a solid wall across the small mouth of the canyon. No arrow could penetrate the wall that now stood as invulnerable as the dragon's back. The horde was swift, they knew, but the horde could not endure like the scales of the dragon. The air hummed with the flight of arrows. The Abzan took shelter beneath their shields and behind trees and rocks. An unnatural wind blew into their faces and for a surprised few, there was no shelter from the barrage. The dragonscale infantry nervously filled in the holes left from their fallen comrades. 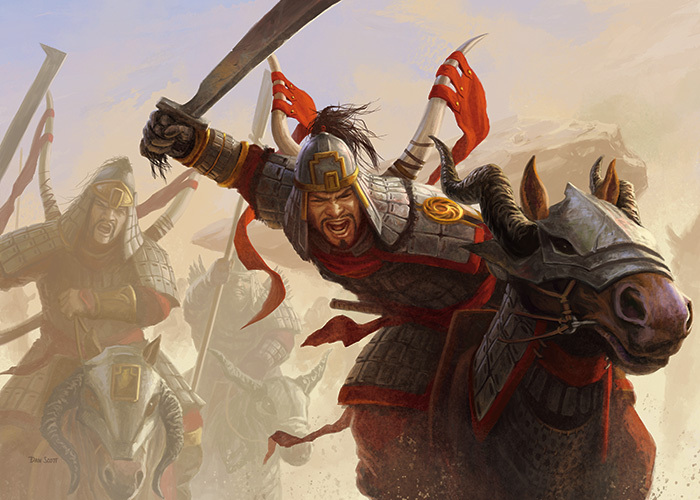 The Mardu horde fluidly divided into two, on the hoof, wheeling toward both ends of the oasis canyon. "To the victor goes the spoils!" the hordechief shrieked, as he drew his sword, the power of his voice spurring the horses faster, as if by magic.